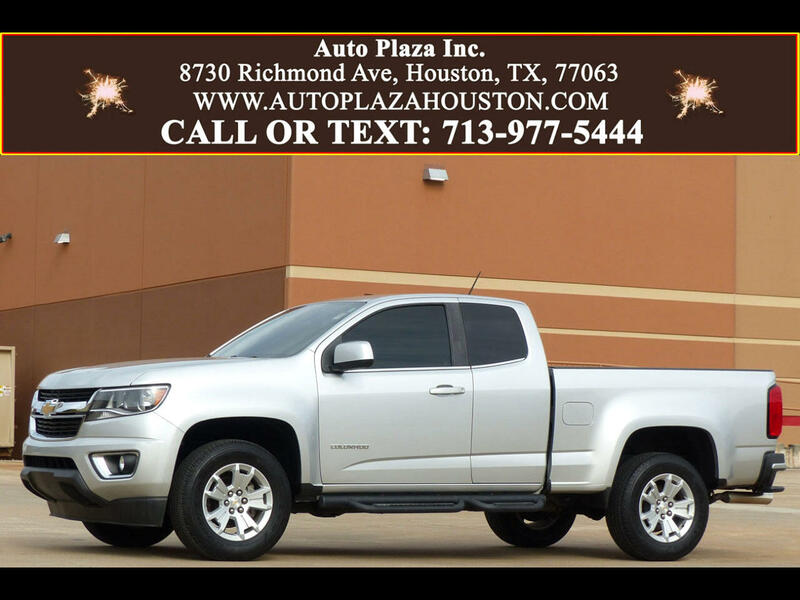 Used 2016 Chevrolet Colorado LT Ext. Cab 2WD for Sale in HOUSTON TX 77063 Auto Plaza, Inc.
With Remaining Factory Powertrain Warranty Good Thru 09.19.20 or 60K Miles!! Auto Plaza Presents To You this One Owner 2016 Chevrolet Colorado 2LT with a Slick 6 Speed Automatic Transmission. This is the Mid Sized Truck Everyone Wants!! Options Include, Custom Muffler, Running Boards, Power Seat, Backup Camera, Corner Step Rear Bumper, Sliding Rear Window, 17' Aluminum Wheels, AUX and USB Port, Bluetooth for Phone, HD/XM Radio, Audio and Cruise Control on Steering Wheel, Locking Tailgate, 6Ft Bed With Line X Bedliner, Traction Control, Electronic Trailer Sway Control and Hill Start Assist, Climate Control, Fog Lamps, Rear Axle 4.10 Ratio, GVW Rating 5,400Lbs, ONSTAR, Power Mirrors, Power Windows, Power Locks, Power Windows, Information Display with Driver Personalization, Odometer, Trip Odometer, and Vehicle Information, and More! Take a Look at the Pictures, the Rugged Design has been applied throughout, Making this Colorado Stylish, Modern and Competent! This Truck is Truly a Combination of Brawn, Beauty, and Boldness!!! This 2016 Chevrolet Colorado LT Makes for a GREAT WORK TRUCK! So CALL NOW to Schedule a TEST DRIVE! Financing Available.
. . . . . . . . . . . . . . . . . . . . . .More Pictures Available On Our Website. . . . . . . . . . . . . . . . . . . . ..WWW.AUTOPLAZAHOUSTON.COM. . . . . . . . . . . . . . . . . . . . .